This is what you never want to happen when you are miles from anywhere. You hit the start button and just get a “click, click”. You left the miniature Lithium Iron emergency battery at home and you are out of phone range so you have to ‘make a plan’. Here are several ‘out there’ methods that may get you out of the poo after you have exhausted yourself trying to push or roll start the vehicle. They are unconventional and you attempt them at your own risk. Jack up the rear wheels (rear wheel drive) and reinforce the support with axle stands if available. Securely chock the front wheels and put the vehicle in fifth gear with the ignition on, and wrap a rope several times around the drive tyre to spin the wheel in the normal direction of rotation. Pull like mad to turn the engine over to start the motor. It’s hard work! Take a fully charged 18v drill battery and ‘jury rig’ the connection using your jump leads – or other adaptations – to connect the drill battery to your dead battery as per a standard jump start method. It works! This is the most bizarre, but it works. It uses a chainsaw to drive the alternator and charge the battery. Remove the chain and blade and the spoked drive sprocket from the chainsaw – replace the sleeve washer and nut back onto the drive – so it looks like a pulley. Remove the drive belts from the vehicles alternator. Connect the belt between the chainsaw drive spindle and the alternator drive pulley. Check the required direction of rotation and engage your drive belt. Start the chainsaw and apply gentle tension on the belt (it does not require much pressure). Keep it going long enough to charge the battery. This is a potentially risky process with unguarded belts spinning at high speed, so assess the risks carefully and work accordingly. Light a fire and let it burn down to hot ashes. 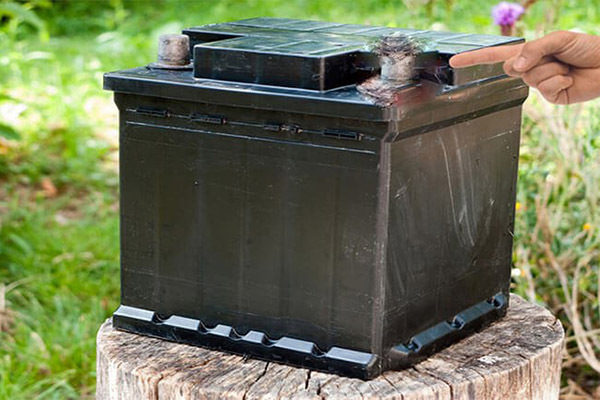 Remove the filler caps from the top of the battery and place the battery in the hot ash – don’t let it catch fire! After a good warm up reinstall the battery, cross your fingers and hit the start button. Just remember, having to be recovered from a remote location will cost you big dollars, so investing in effective back-up systems makes very good financial and safety sense. If none of these tips gets you going you will need to get on the satellite phone or HF radio to get assistance. If you don’t carry either of these essential safety devices, perhaps you should review your remote area safety planning when you get home.